It's that time of year again... we're getting ready for Sync the City! On Thursday 23rd November we're taking nine of our team to the 54-hour startup challenge and this year we need your help. Sync the City is an event that brings together young people and budding entrepreneurs with experienced business mentors and technical experts. They have 54 hours to form teams, develop ideas and pitch them to a panel of judges, including demonstrating a working protoptype. The team the judges deem the winner get £4000 cash and the winners of the people's choice award go home with £1000. Both teams also get valuable sales training and one year associate membership of Norfolk network. 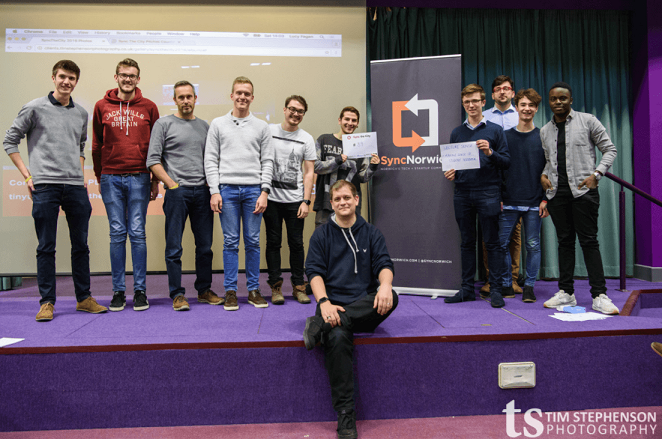 We are passionate about game changing ideas, that's why we are sponsoring Sync the City this year and our two founders Neil and Brian will also be mentoring some of the teams. We're taking almost half our team to the event and we'll be looking for brave ideas that can disrupt an industry. We'll also be keeping an eye out for potential people we'd love to work with. If you think you've got a winning idea register for tickets here and we'll see you there! We know that there are plenty of people out there who have the great ideas, but can't make it to the event. That's why we want to be your champion. Send us your ideas and we'll take the best ones to Sync the City to put into action! To share your ideas direct message or tweet us @earthware or email rachel@earthware.co.uk. P.S. We'll be tweeting about our favourites so don't send us anything top secret!